Our museum and collections are dedicated to preserving the history of Glendale, Ohio. 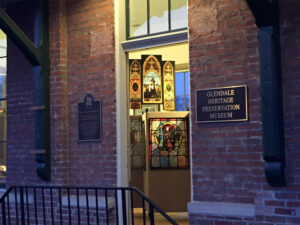 GHP maintains an archive collection of photographs, documents, objects and other materials that tell the story of Glendale’s people and places. The largest portion of our collection is photographs. We maintain a Family File and a Structure File with information on a number of the houses and buildings in the Village, a Map Collection and much more. Click here to begin your exploration of our database. An excellent way to get started is to use the Random Images button. 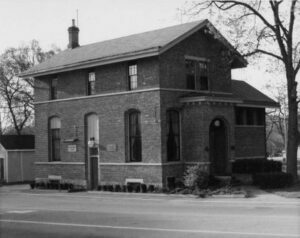 The police building was completed in 1871 at a cost of $3,945 and the Village Council met in its new chambers in October of that year. This charming building has been used as a Police Station since 1873 and is believed to be the oldest continuous use police station in the country. It was originally designed to house administrative functions, including the mayor’s office and council chambers, as well as serving as the police station and jail. The architect was Harry N. Wilson and the builder was Charles S. Sundray. When the founders of Glendale Heritage Preservation were developing a strategy to protect historic homes in Glendale they decided to use the police Station as a test case for designation on the National Register of Historic Places. Glendale Heritage Preservation was founded by Doreen Gove and other concerned Glendale citizens when they became aware that there were no safeguards to local property development. GHP was started in 1974 and immediately began the process of mapping the village and cataloging existing buildings. These efforts and more led to the Glendale Historic District being listed in the National Register of Historic Places by the U.S. Department of the Interior in 1976. The following year, the district was designated a National Historic Landmark. A plaque in the village square attests to this fact. GHP is headquarters at the old CH&D railroad depot (1880) which serves as museum, gift shop, and archive storage facility as well as a meeting place for the organization. As a non-profit corporation, GHP is funded by membership dues and by occasional bequests and grants. Incorporated in 1855, Glendale covers about one square mile and has a population of 2600. The village is nestled between Sharonville and Springdale, just fourteen miles north of Cincinnati and the Ohio River. It is governed by a mayor and six councilmen who are paid exactly the same as they were in 1855: absolutely nothing. 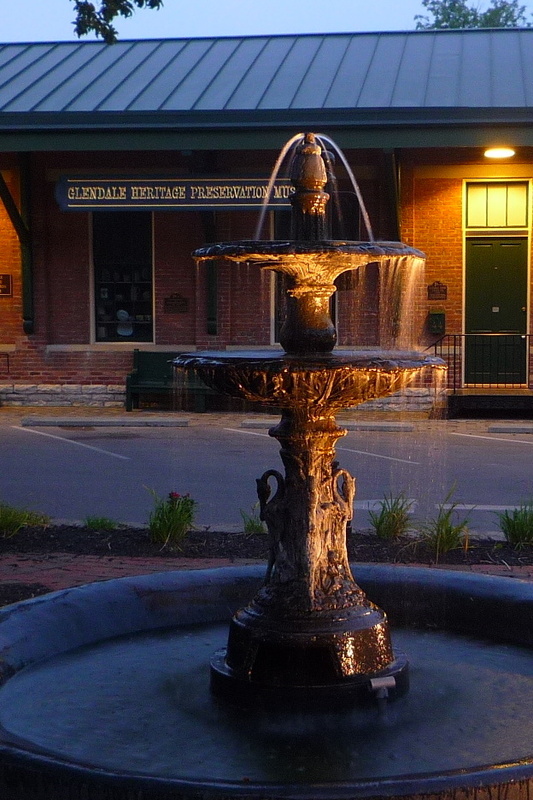 The village, conceived as a totally independent community, has its own water works, sewer system, and police department, as well as a modern volunteer fire department. Listed in the National Register of Historic Places, the Village’s 392 acre Historic District was declared a National Historic Landmark in 1977 and designated a local historic district by the Village of Glendale in 1993. With this special recognition, Glendale was placed on a level with the Charleston Historic District and the Alamo. The Village was chosen for this distinction because it was the earliest known planned subdivision in America laid out in a curvilinear plan according to topography. (Prior to this towns were normally laid out in a grid pattern.) Glendale is also known as the first planned railroad commuter town in the nation. 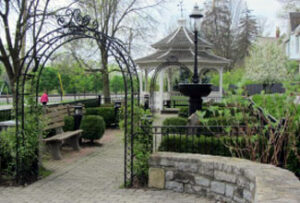 The Village of Glendale maintains its own website at http://www.glendaleohio.org. In 1851 the Village of Glendale began as the idea of two local entrapenauers, George Crawford and Henery Clark who envisioned an idylic country community with railroad access to Mill Creek valley industries and downtown Cincinnati as well as points north. They formed the Glendale Association of thirty prominent citizens and adopted a town plan that was designed around the existing topography instead of a grid. Building started immediately and Glendale incorporated as a village in 1855. Abolitionist sentiments were strong in the area that was to become Glendale. In 1842 a local preacher, John VanZant, was arrested and convicted for his efforts to aid escaping slaves. Legend has it that many homes in Glendale were used to harbor escaping slaves but only a little hard evidence remains. In 1863 Morgan’s Raiders drove through Glendale under cover of darkness, regrouped on the east side and continued on their raid after breaking into the railroad depot and telegraphing false information to Union troops. Glendale’s unique street plan and architectural heritage is chronicled in books published from 1869 to today. Once a country suburb of Cincinnati reached only by rail, the Village is now situated in the bustling Millcreek Valley, near major industrial, financial, and shopping centers. Stimulated by the aesthetic qualities of the Village, its residents have not settled for the mediocre. Parks, public services, and schools are maintained to the highest standards. The Princeton City School District serving Glendale has national distinction for its advanced curriculum and comprehensive programs. The grade, middle, and high schools are within walking distance of the Village center. A choice of housing, new or historic, modest or stately, with apartments and condominiums included, accommodates those having a variety of needs and interests. A unique rapport and mutual respect, evident at social gatherings here, exists between residents of all ages and background, adding greatly to the friendly, informal mood of the village. Indeed, a sense of concern, belonging, and pride in the community grows with one’s length of residence. Since unsuitably styled new construction or inappropriate alteration of existing structures will jeopardize the District’s National Register listing and National Historic Landmark designation, the GHP works to keep residents informed of their duty to respect this historical village. Fortunately, the Village of Glendale moved to protect the Glendale Historic District in 1993 through a local ordinance, providing oversight of alterations in the district by the Glendale Planning and Historic Preservation Commission. Historic designation offers many benefits to local homeowners of significant houses and buildings within the Historic District boundaries. In addition to access to special tax benefits in some cases, they have some measure of protection from federally funded projects such as unwanted highway widening. Glendale’s National Historic Landmark status involves monitoring by the U.S. congress and promotes continuing community awareness of this special architectural environment. The Village administration supports the work of Glendale Heritage Preservation in instructing newcomers that preservation is a responsibility to their neighbors and to the future.